The English Vanguard portal just updated moments ago to reflect a change in the official Fighter's Rules governing Bushiroad-sponsored tournament play. 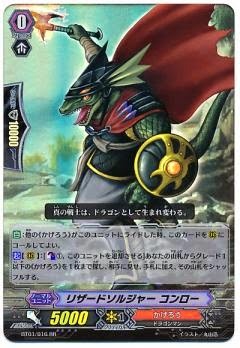 Effective on August 20, all prints of Lizard Soldier Conroe are restricted from being used as the first vanguard in English tournament play. As with his predecessor on the restricted list, Barcgal, up to four copies of Conroe may still be included in any deck, but he may not be set as the grade 0 to begin the game with. This is the first modification made to the English-language restricted list since July 2012; while some discussion arose in the community over the possibility of Dragonic Overlord the End finding a place on the list last year, nothing ultimately came of this. Restricting Conroe for the English-language format emulates an identical restriction made by Bushiroad of Japan in January. By eliminating Conroe from the vanguard circle, part of Nouvelle's central engine has been cut out. 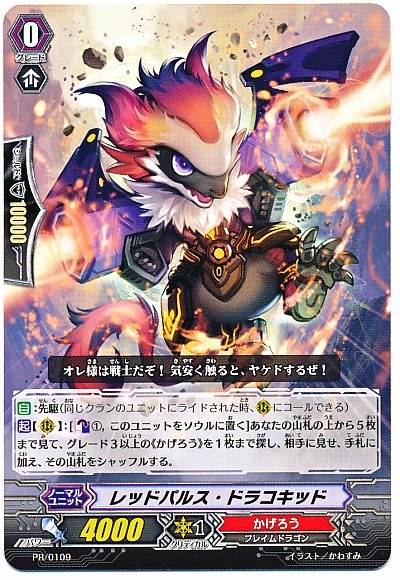 One of the supporting reasons that it has been so easy for Kagerou cardfighters to treat Nouvelle Vague as simply another grade 3 in the deck is that Conroe's counterblast allows his cardfighter to search for Nouvelleroman Dragon, who in turn can then return a copy of Nouvelle from the hand to the deck to search for Kagerou's grade 3 break ride. Effectively drawing a grade 4 becomes the same as drawing a grade 3, almost entirely eliminating the risk factor of playing Nouvelle and giving the deck an inordinate amount of consistency relative to its reward. Removing Conroe makes it harder for Kagerou fighters to dominate above and beyond the other decks of the format, and bumps up the clan's grade 3 searcher Red Pulse Dracokid into becoming their go-to FVG. 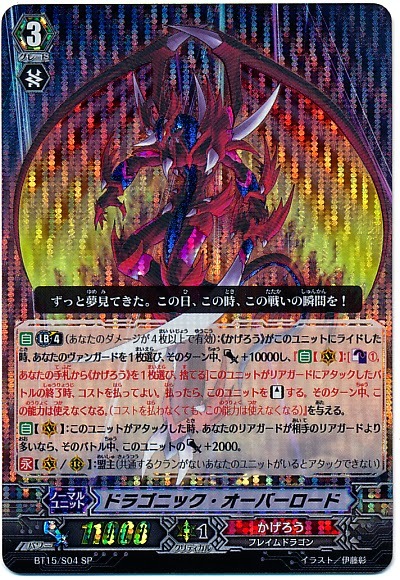 In order to both capitalize on the extra soul available from using Red Pulse's skill and compensate for no longer being able to search for any grade 1, most Japanese cardfighters adapted their decks with additional copies of Calamity Tower Wyvern, a Luckbird clone that when called can soulblast 2 to draw a card. English-speaking fighters are expected to follow suit, and this adaptation is important because it makes Dragonic Nouvelle Vague's persona blast much more difficult to activate. The persona blast requires three soul to use, so by encouraging multiple Calamity Tower calls the post-restriction format also puts a heavier limitation on Nouvelle's limit break--which can completely destroy every rearguard on the opponent's field. This helps to mitigate the grade 4's intense control of the game. While Bushiroad USA attributed the restriction to the Team League 2014 results, it was likely also made with an eye to the recently announced World Championship 2014. The restriction encourages cardfighters who left the game as a result of Nouvelle's dominance to return to it, and promotes a lower bar of entry for newcomers, who already face an overwhelming number of professional decks to learn and keep track of. 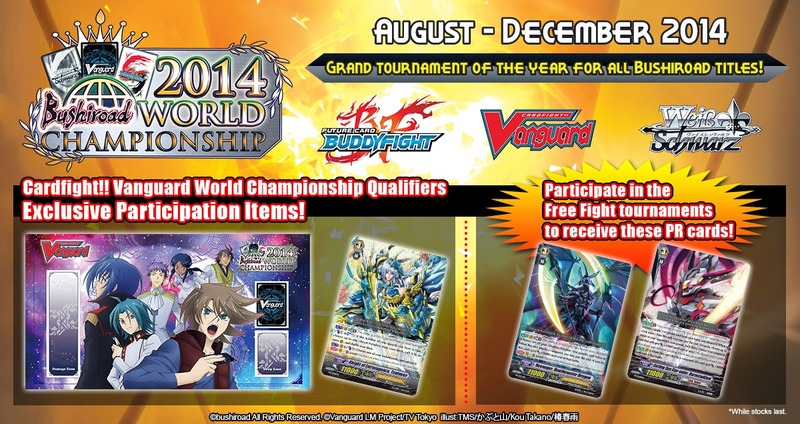 Early this morning the events page for World Championship 2014 went up on the official English Vanguard portal, heralding the dates for the upcoming tournament's regional qualifiers. As in past years, cardfighters will have to qualify at one of the regional events around the world to attend their country's invitation-only continental championship, the top 4 of which will be able to then qualify for the international grand finals in Tokyo. This year's tournament will feature an exclusive commemorative playmat for all participants, as well as the Shadow Paladin and Link Joker promo cards "Revenger, Deathmaster Dragon" and "Setting Sun Star-vader, Darmstadtium." Designed as an alternative boss card for the former clan and a new break ride for the latter, both of these cards have popular fan followings outside of the mainstream Raging Form Dragon and Chaos Breaker/Glendios decks. The preceding WCS2013 ended with Luxembourg cardfighter Almeida Stewart being titled second world champion; however, in light of the cheating accusations and controversy surrounding his confessed robbery of the card shop La Caverne du Gobelin, many cardfighters have doubted the legitimacy of his title. Beginning on August 30 and ending in late December, World Championship 2014 will feature nineteen regional qualifiers around the world in all, with a special qualifier held in Tokyo. Similar to the tournament held for Japan in WCS2013, this is suspected to be a qualifier which would allow its top fighters to participate directly in the international finals without previously qualifying at a continental tournament. A partial list of locations is available through the official website, but some are not yet finalized. With many tournaments taking place around or after the release of VGE-BT15: Infinite Rebirth, alongside the existing grade 4 Dragonic Nouvelle Vague from Divine Dragon Progression, one of the major contenders in the new format is anticipated to be Star-vader “Ω” Glendios. Famous for its ability to prevent cards from unlocking through its limit break, the deck has gained some popularity in Japanese tournaments for how heavily it slows down the game in the hands of a skilled cardfighter. Even into the Legion format it has continued to hold up well under the pressures of the new professional play. By using Wingal Brave's skill in combination with Blaster Blade Seeker and Thing Saver's Legion, Chii was able to reliably search for his lone copy of Phantom Blaster "Abyss." Blaster Blade Seeker being on the vanguard circle during Legion would satisfy the requirements necessary for Wingal and for the Blaster-based subclan attackers to trigger. This gave him two restanding Legion vanguards to work with, patching the general weakness of the Seeker subclan's secondary grade 3s. In most previous formats this kind of mixing would be impossible because of the Lord skill, which prevents a unit from attacking if any card on the field does not have its clan, but from Seeker of Hope onwards new cards have foregone Lord from their printings entirely. And because of the special permission given to Royal Paladin cardfighters in team tournaments to use Shadow Paladin cards--originally a rule made for the sake of Majesty Lord Blaster fighters in 2012--unlike the majority of hybrid decks seen in VGCS tournaments, this deckbuild would be completely legal for play in Bushiroad's official events. So it goes that first place in this year's Kanazawa regional championship, held over the 17th, is Hayashi Daiki with one of those very same hybrid decks. Go to the heading [FR14KN] for his decklist. 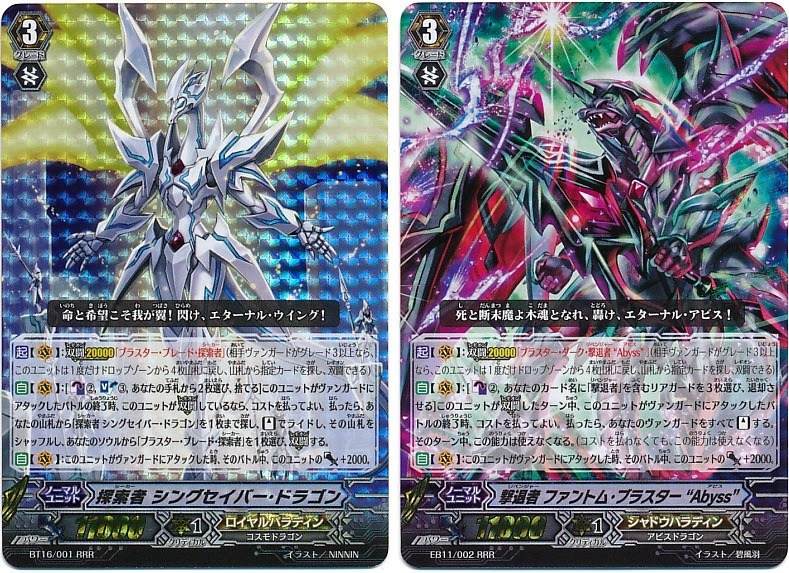 The last major developments of these tournaments came from the Kansai VGCS' championship team Forward Pest (ペスト) playing Star-vader “Ω” Glendios with the new trial deck card Companion Star-vader Photon in the deck. 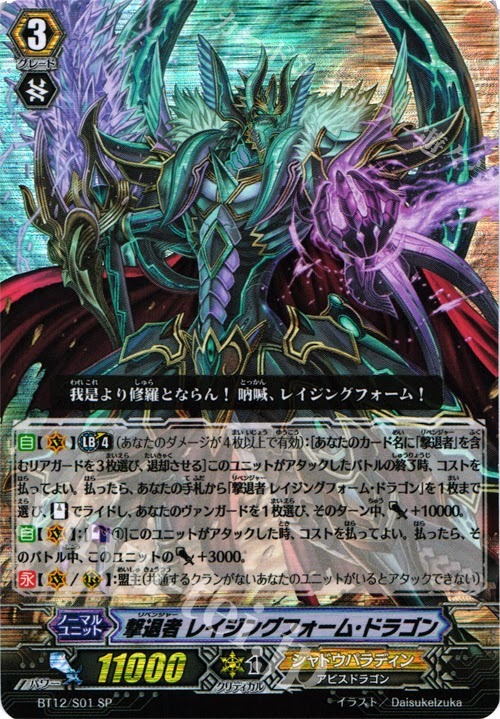 Photon's skill allows his fighter to lock one of the opponent's rearguards when called if they already have a locked rearguard, easily shutting down their field and promoting synergy with Glendios' "Omega Lock" limit break, which prevents the locks from opening for one turn. At times Photon can act like a superior Cold Death Dragon, helping lock the opponent's entire field so that Glendios will automatically win through its ultimate break at the beginning of its next main phase. Three hours ago Bushiroad Inc. uploaded the formal announcement of the start of World Championship 2014 to the official cf-vanguard web portal and Cardfight!! Vanguard Facebook page. Slated for an August to December timeline, this year's international competition will use booster sets up to VGE-BT15: Infinite Rebirth, to be released in September. While very little information is available regarding WCS2014 at this time, fans remain hopeful for the implementation of the long desired best-of-3 format championed in VGCS, ARG Circuit series and Cosmic Oasis tournaments. 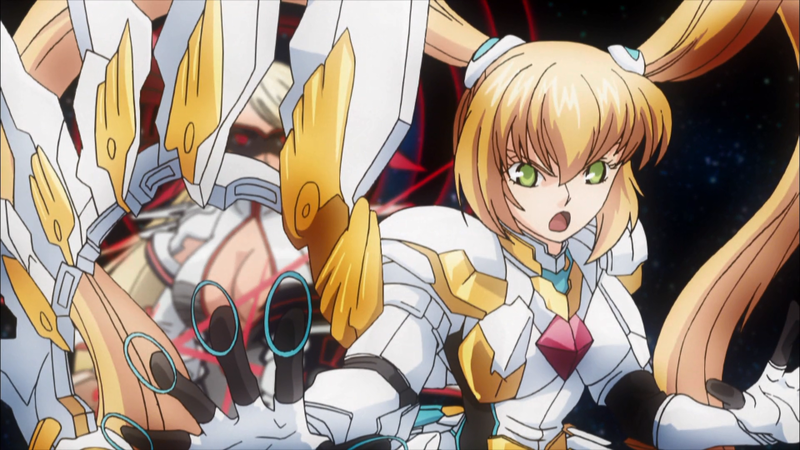 And earlier today Oricon Inc. uploaded a trailer for the upcoming Cardfight!! Vanguard Neon Messiah theatrical film to their YouTube channel. 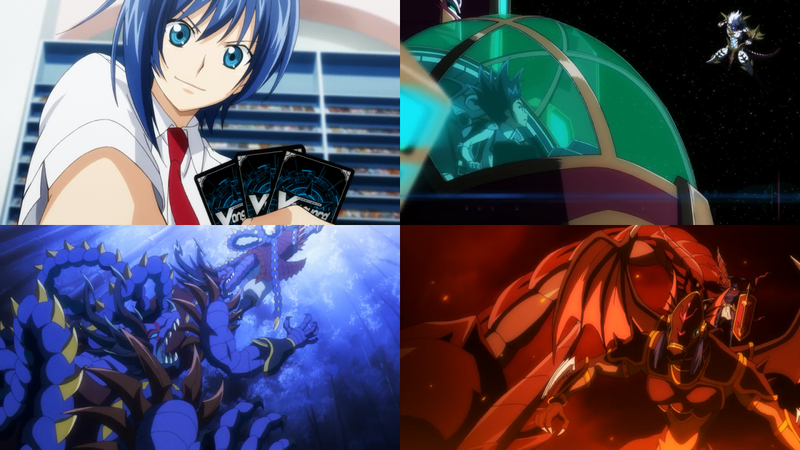 The trailer (embedded below) teases a fight between Aichi and Kai using their traditional Royal Paladin and Kagerou decks, appearances by Morikawa playing against Osamu's Megacolony, Kamui playing his Raizer deck from the fourth season versus Naoki with Big Bang Knuckle Dragon, as well as a match between Aichi's sister Emi and her friend Mai with different Bermuda Triangle decks. A stinger image planted after the trailer hints at the introduction of antagonist Ibuki Kouji's mysterious Deleter cards. A translation of the trailer's dialogue is hosted below. The final image of the trailer is captioned ヴァンガード消滅の危機?! Vangaado shoumetsu no kiki?! "Vanguard annihilation crisis?!" hinting at one of the mysterious qualities associated with the Deleter cards, their ability to make the vanguard itself disappear. This idea was first introduced more than a year ago in Itou Akira's Cardfight!! Vanguard manga, from which the Deleters originate, and Neon Messiah's narrative appears to be following through on the plotline. The manga is at present being serialized in English by Vertical Inc., and late this August the third of the seven volumes currently released in Japan will be adapted to English. 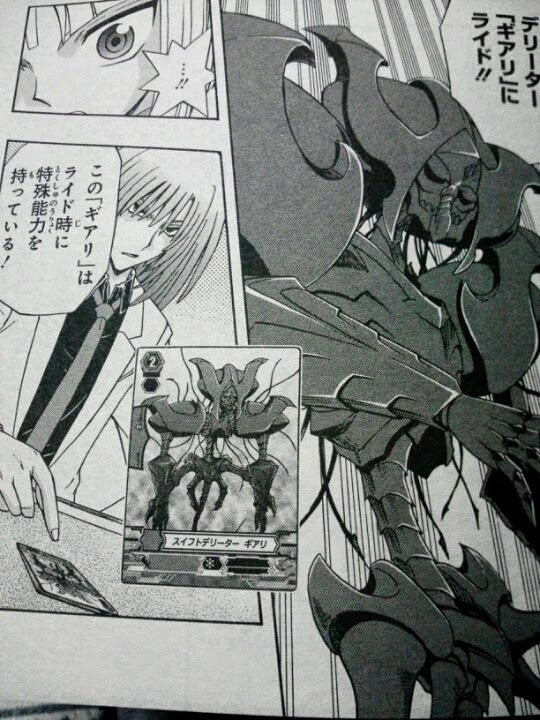 Finally, the Cardfight!! Vanguard movie version will debut! Both the anime we all appear in, and the following drama! On September 13th, Stand Up! The movie has not yet been licensed for western release; at present English translation of the series is primarily handled by Crunchyroll, which is responsible for simulcasting subtitled releases of the anime. No word on their potential involvement with the film has been made. Perfect defense cards are notorious as the most expensive and necessary part of every deck. In a format where the vanguard lane regularly pushes 31~41000 power with multiple criticals and restanding skills, the ability to totally nullify an attack is popularly understood as being too good not to have access to. Even in casual play it's difficult to simply enjoy the game when there are plays that are outright impossible to guard without a perfect defense. Consequently, the perfect defense cards for the most popular clans can go for $11~16 individually, with a full playset costing $44~64, and during the height of tournament season prices tend to climb into abnormal ranges. (World Championship 2012's Halo Shield Mark and the Challenge Cup's Wyvern Guard Barri come to mind, both marked up within their own eras to $30 apiece.) This has set a high bar for entry into the Cardfight!! Vanguard trading card game, making it more difficult both for players on the fence about the game and those of lesser means to play against established cardfighters. However, the international release of VGE-BT14: Brilliant Strike last Thursday has serious consequences for both entry-level play and professional Vanguard, marking the formal introduction of Quintet Wall to the rest of the world. Quintet Walls are new variation of cards bearing Sentinel, which previously belonged exclusively to perfect defense cards; the basic characteristics are that these cards have a shield of 0 and the Sentinel skill, which states that only up to four cards with Sentinel may be included in a deck. The actual skill of Quintet Wall cards is to counterblast 1 and superior call five cards from the top of the deck to guard with, potentially giving vast amounts of shield to work with that do not come from the hand. After playing a Quintet one is still free to call additional cards from the hand, opening up an alternative defensive option on par with perfect defense. Having preordered in the range of half the price of the cheaper perfect defenses, some of these Quintets like Sword Formation Liberator Igraine have sold for as low as $4, in this example compared to her perfect defense counterpart's $13. These prices have developed in light the poor reception of the mechanic by more competitively-minded cardfighters, and because of these cards' perceived lack of use prior to the introduction of Legion. Halving the cost of effective deckbuilding encourages cardfighters to try out different clans, and makes it easier on entry-level fighters to learn different play styles without having to dedicate financially to a clan they aren't certain of. 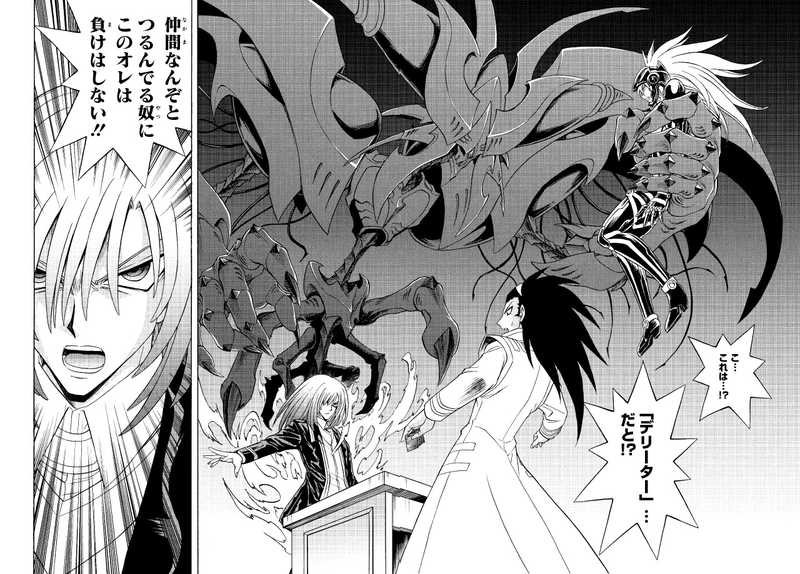 In this way Cardfight!! Vanguard is becoming cheaper to play. For entry-level players Quintet Walls are an efficient means to get into playing a clan without paying the exorbitant "entry fee" of assembling four perfect defense cards. This is not a perfect substitution; as outlined below, if Quintets are to be used at all then they are best used in careful combination with perfect defense, not as a total replacement. They're also dangerous when overused. So for beginning players running just three Quintets can be serviceable, both to prevent abuse and help with not over dedicating to the mechanic, leaving them prepared to eventually transition towards perfect defenses once this becomes financially practical. Having inferior but more strategically complete decks helps new fighters top more consistently at their card shops, accumulate store credit over time and eventually be able to afford the "completed" versions of their decks. Outlining their characteristics as a whole, because a Quintet Wall only activates from the hand you cannot activate a Quintet called by a Quintet, but perfect defense cards called in this way will be usable because they trigger when placed on the guardian circle regardless of where they originate from. Since Quintet Walls and perfect defense cards share the Sentinel skill this interaction normally only compensates for not running a perfect defense instead of a Quintet in the first place. However, there are specific matchups that Quintet Walls shine in. Versus Dragonic Nouvelle Vague they make more efficient use of grade 0 units, as DNV only blocks grade 0s called from the hand not the deck, and those grade 0s are better off in the guardian circle than in your hand. You do run the risk of eliminating positive drive checks for next turn in this way. It can be argued that you could have used a perfect defense versus DNV to similar effect, but that would cost you another card from the hand which may be more difficult to front compared to a single counterblast. We can make a more general observation from this that using Quintet Walls has a side effect of conserving hand advantage over time, although this is not perfectly true as there will be cases where you need to patch up your defense with additional cards from the hand. Quintet Walls also directly counter the Daikaiser break ride skill, which has been a menace in both the Japanese and English-language formats. 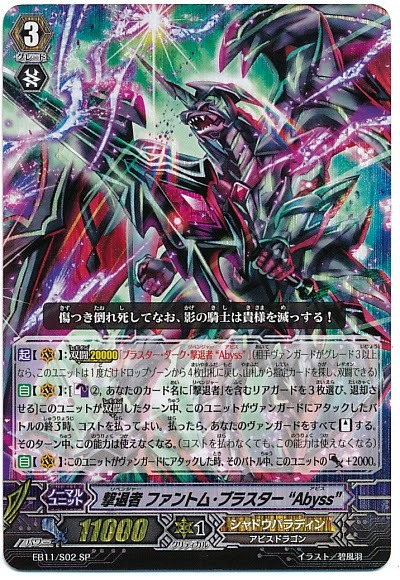 Since Daikaiser can only retire one card per grade 3 drive check on the turn of his break ride, Quintet Walls are useful for dividing up the shield between units called from the deck. Let's consider an extreme example; 40000 shield divided among three 10000-shield units and two 5000-units. If Daikaiser attacks boosted for 30000 power after break riding itself versus a current defense of 51000 power, even two grade 3 checks will only bring the total shield down to 31000 power, just enough to block the attack. The remaining rearguard attacks are much easier to guard and the hand as a whole is preserved because the bulk of the turn's defense is split among a large amount of resources that you yourself do not have to front from your own hand. Quintet Walls are also optimal to stop early and midgame aggression, as they aren't as expensive in terms of cost as perfect defenses and so can be used more freely earlier in the fight. However, they have specific weaknesses versus high-power center lanes that can consistently demand excessive amounts of shield. Versus Tryannolegend, Labrador and Ezel Scissors, each of whom can consistently make a 31~41000 power 2 critical lane, perfect defenses are vastly preferable. The key to using Quintets effectively is to balance them with perfect defense cards, so that your plays can be more flexible. A ratio of 3:1 perfect defense to Quintet or 2:2 is considered a good balance. Of course, Quintets are not right for every deck, so the old standby of 4:0 is still very viable. If you have the open counterblast demanded by them, they can be beneficial to try and take advantage of, but they are not a straight upgrade nor an absolute replacement over perfect defense cards. Be wary of how many cards Quintets remove from the deck as well--using just two of them removes one fifth of the deck, and using four of them will take out 20 cards in total. This can make decking out a very real possibility. The Legion format on the whole benefits much more from Quintets than limit break vanguards do, as the mechanics of that format allows for trigger units called by Quintets to be freely recycled back into the deck on the following turns. Versus Dragonic Kaiser Vermillion and other cards that can attack multiple units simultaneously, the cards superior called by a Quintet Wall can also be individually allocated to guard separate units. For example, if an unboosted in-Legion Big Bang Knuckle Buster attacks for 25000 power against four units comprising the vanguard (11000 power) both frontrow rearguards (9000 power each) and a backrow booster (7000 power) and your Quintet calls out one perfect defense card and four 10000-shield units, you can discard to activate the perfect defense and protect the vanguard, then allocate 20000 shield each to one of your frontrow units and your booster. The third unit which is unprotected will be retired when the attack hits, but in order for Big Bang to hit the remaining rearguards it will have to drive check a trigger, which is not a bad deal when you consider that you've only fronted two cards from your hand to protect three of your four units. While the same amount of cards was spent from the hand as if the Quintet were just a perfect defense, being able to pull out additional shield protects the remaining rearguards and decreases the overall impact of Knuckle Buster's Legion skill, while still leaving room to put down additional cards as needed to secure the rearguards it attacked and be able to take on the opponent's remaining attacks for the turn. By 2015 a total of fifteen clans are to have received one or more Quintet Walls; Summoning Jewel Knight Gloria for Royal Paladin, Hatred Prison Revenger Cessair and Barrier Witch Graine for Shadow Paladin, Sword Formation Liberator Igraine for Gold Paladin, Shield Goddess Aegis and Regalia of Frozen Breath Svalin for Genesis, Dragon Knight Gimel for Kagerou, Hardship Brawler Toshu for Narukami, Silver Snow Sasame for Murakumo, Machining Ladybug for Megacolony, Moth Orchid Musketeer Christie for Neo Nectar, Blue Storm Guardian Dragon Icefall Dragon for Aqua Force, Duo Promise Day Colima for Bermuda Triangle, Reef Banshee for Granblue, Baron Amadeus for Spike Brothers, Metalborg Bri Knuckle for Dimension Police and Shieldraizer for Nova Grappler. Those expected to benefit the most from the mechanic are Granblue and Neo Nectar, whose drop zone-centric strategies make the cards a welcome addition to their playbooks, while at least one Quintet Wall has been a standard staple to help Legion decks accelerate their gameplan. Despite having a number of counterblast 2 skills in their respective variations, Nova Grappler and Megacolony do stand to benefit from Quintets' advantage-conserving aspects, as these builds have a difficult time amassing card advantage and being forced to drop an early perfect defense can represent a major setback to their gameplan. 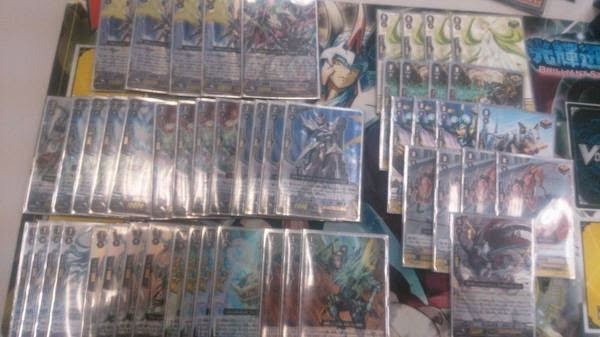 The second Hokusetsu Vanguard Championship took place in Japan over July 6th, with multiple Shadow Paladin cardfighters playing different variations on Phantom Blaster “Abyss” making the fan tournament's top 8. 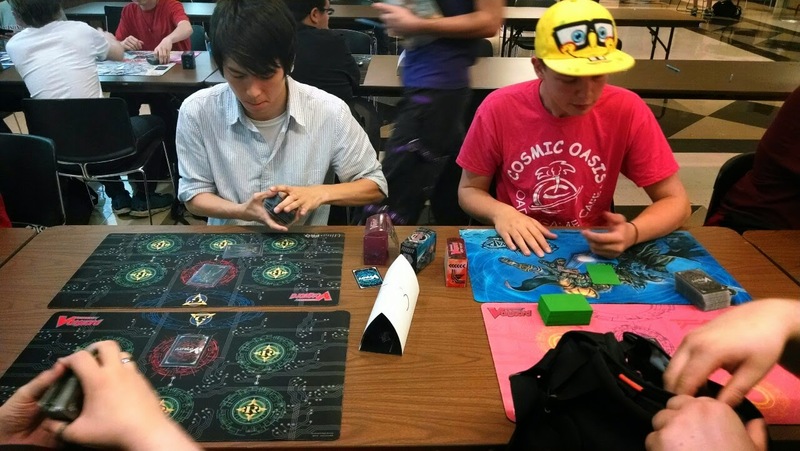 The 96-person tournament saw a clash between “Abyss” and the current Nova Grappler boss Ultimate Raizer Mega Flare for the tournament finals, with Seeker and Regalia cardfighters taking third and fourth place. While the new Blaster unit's debut was anticipated by the public, prior to Hokusetsu many expectations had shifted to the newly emergent Witch deck within the same clan, and it is to some surprise that Revengers have continued to hold favor. 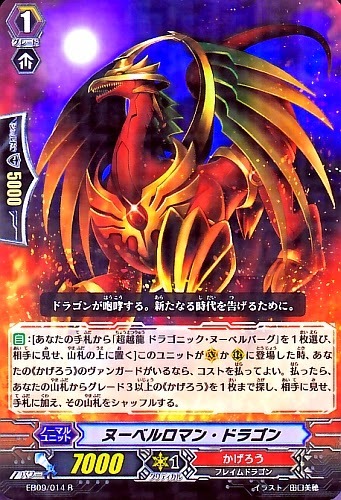 In a move generally predicted by the rest of the community, Hokusetsu champ Mirutae's “Abyss” deck used the well-established Raging Form Dragon in combination with its Legion grade 3, providing two separate self-standing vanguards each able to attack in the range of 21~22000 power on their second strike. The pairing was debated leading up to the release of EB11: Requiem at Dusk, with many arguing that the slower Mordred Phantom would make for a more decisive turn by building a stronger center lane and rearguard formation. Mirutae's build lacked favor with the three other Revenger fighters of the Hokusetsu top 8, who instead followed up on the concept of integrating existing Phantom support with Legion. Among these fighters was Kimuti of the second Kansai CS, known for pioneering Duo Temptation Reit early after the release of Divas' Duet. This was not the first appearance of Blaster “Abyss” in professional play either. Shortly before pro cardfighter Tochibi Yuusuke had captained Osaka's champion team in Bushiroad's ongoing 2014 VF Koushien tournament. Unlike the Hokusetsu champion, Tochibi's deck eschewed RFD in favor of splitting its grade 3 count between “Abyss,” Dragruler and Mordred Phantom, cutting the original BDR and Dorint entirely for Lukea and Rakia. By emphasizing Phantom support, the use of Swordbreaker soulblasts and prepping “Abyss” with break ride setup, Tochibi worked to enhance the gravity of his Legion's restanding skill, building up towards a single defining turn to finish the game. Registration for Hokusetsu began from 9:30 to 10:30 AM, with on-site registration being carried out from 10:30 to 11:00, and the tournament formally began at 11:10. 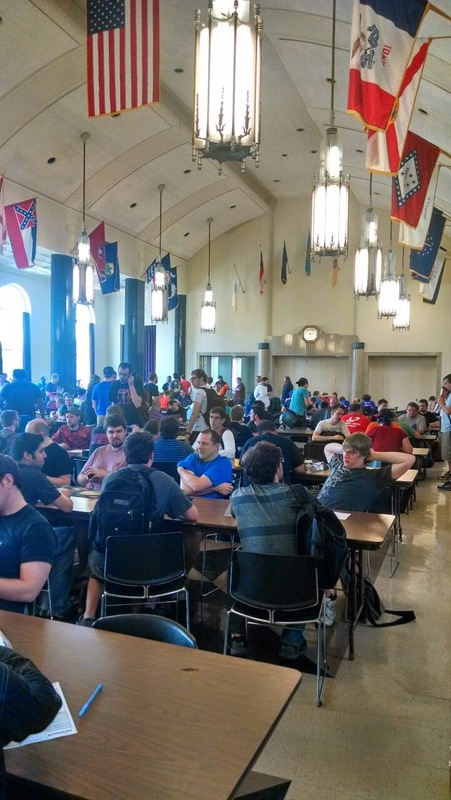 The tournament opened with four rounds of Swiss draw which lasted until 2:20 PM, followed by a cut to top 8 and ended at 7:30 PM. Like other VGCSs, Hokusetsu followed a best of three format rather than the best of one endorsed by Bushiroad Inc. Rounds were 40 minutes in length prior to top 8, and 50 minutes afterwards. Organized by tomato (sic), kuroneko, Pere and Tawaran, the tournament had an entry fee of 1000 yen (approx. 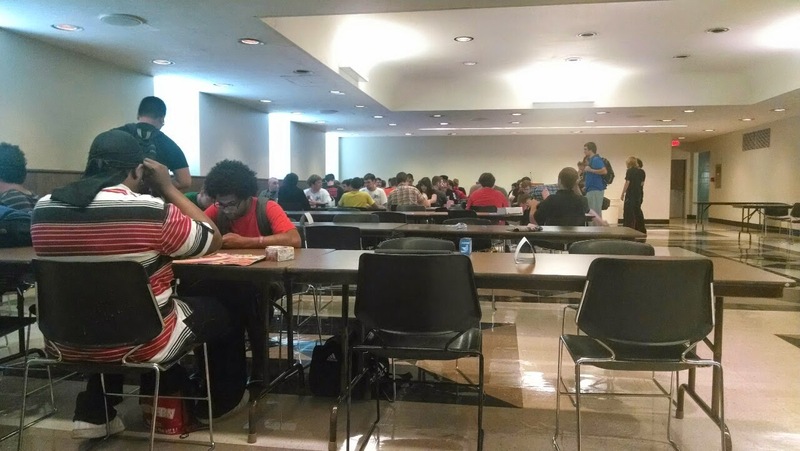 $10) per person, with first place receiving a Nintendo 3DS XL as a prize, second place a standard Nintendo 3DS, and third place six extra booster boxes, three each of Requiem at Dusk and Waltz of the Goddess. The previous Hokusetsu CS was held last May, and was held in a team tournament format, with Team Wild Hitter's captain Rinon being known for establishing a very early version of the then-new Seeker deck using primarily trial deck cards. In other news, MSN Japan has uploaded an article on the upcoming movie Cardfight!! 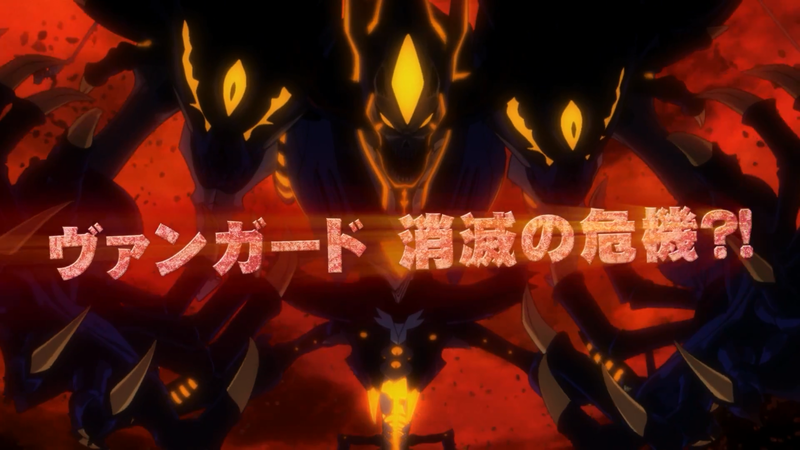 Vanguard Neon Messiah, along with a promotional image of the main cast. Cinema Today had previously shown off lineart of antagonist Ibuki Kouji's primary unit for the film, an unnamed Link Joker from the Deleter subclan who will serve as the cover card for the film's trial deck, MTD01: Malefic Deleter. 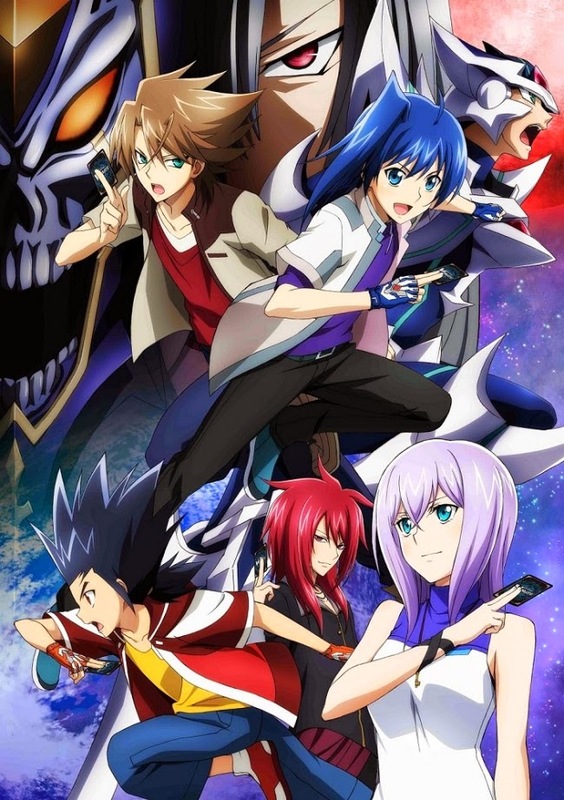 Plot summaries for the film outline Neon Messiah as being set during a global Vanguard tournament known as the "Messiah Scramble," and that protagonist Sendou Aichi will be fighting side by side with his lifelong friend and rival Kai Toshiki. The release date for Neon Messiah is currently set as September 13th. The above teaser for one of the Cardfight!! 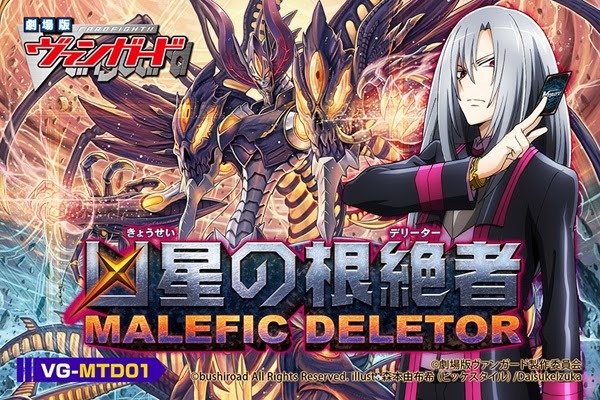 Vanguard movies' promotional sets VG-MTD01: Malefic Deleter was put up on the Japanese Vanguard portal early this morning, giving an early look at the upcoming cards for the climactic movie tie-in to the ongoing fourth season. Set for a September 24th release date, the trial deck will promote the upcoming movie Neon Messiah by featuring cards used in the film by antagonist Ibuki Kouji (伊吹コウジ). Introduced more than a year ago in the Zero Starter Set chapter of the manga as a childhood friend to Kai Toshiki, Ibuki is the primary user of the Link Joker clan in the manga and a character many have waited for to be introduced to the anime series. 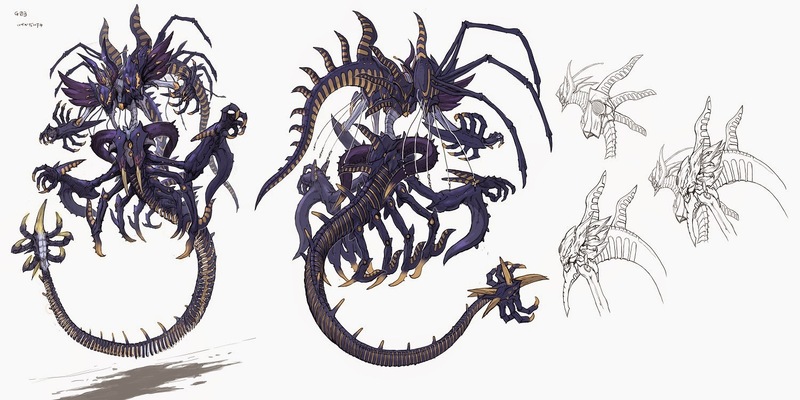 Unlike the Link Joker units introduced in the third season of the anime, Ibuki's Deleters in the manga each have a much more grotesque and alien slant to them, resembling monsters out of traditional science fiction rather than the Star-vaders' elaborate Cyber Dragons. Ibuki's strategy in the manga is to use the new mechanic Banish Delete (バニッシュデリート Banisshu Deriito) which sends an opponent's rearguard into the drop zone in the Locked position, in practical terms removing it from the game and preventing its use. This has so far only been demonstrated with his grade 2 Swift Deleter Geary, who retires one of Ibuki's own rearguards to retire one of the opponent's face down. Moreover, he has recently demonstrated another ability through his grade 3 Docking Deleter Gray One, "Delete End" (デリート・エンド Deriito Endo) whereby the game is automatically won through the condition of having the opponent's vanguard face-down. Not much has been shown about how this is achieved, so the mechanic is poorly understood. "When ridden, retire 1 of your own rearguards, and then retire 1 of your opponent's rearguards. Your opponent's retired card enters the drop zone face-down." Malefic Deleter is slated to be accompanied by another movie-centric set with the same release date, VG-MBT01: Neon Messiah. 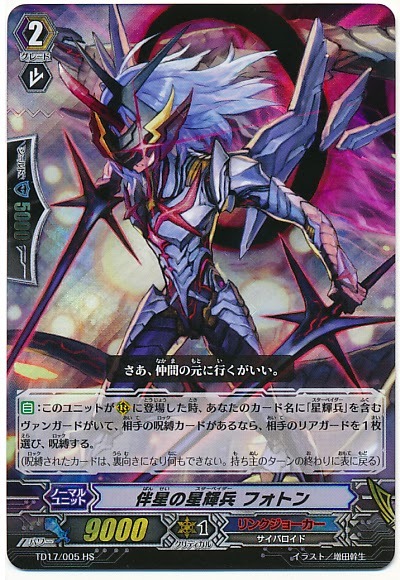 Comprised of just fifty cards, MBT01 will support the Link Joker, Kagerou, Gold Paladin and Royal Paladin clans, and the cards present in the set will be compatible with those in Malefic Deleter.